i put LaRue in a poem in the second chapbook, Land Wide to Get a Hold Lost In. LaRue attempted to find the rattlesnake on our farm that almost got me (my feet!) one day in early may 08. he couldnt find that snake, just its hole which it was not in. 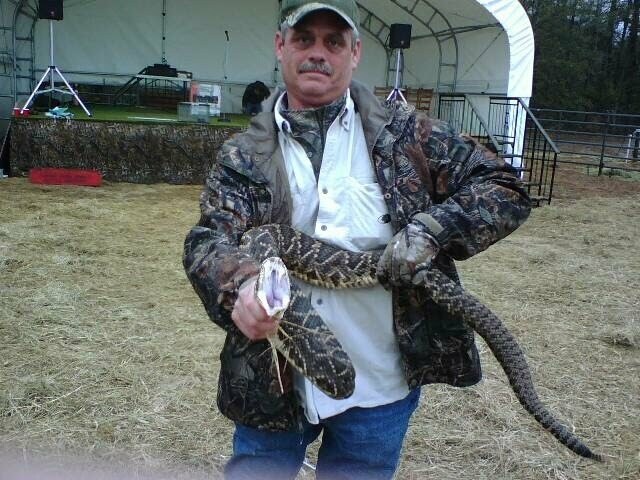 LaRue gets people's snakes & he not only fixes household appliances (as i wrote) but also is known to be one of the better handymen in douglas, ga: fixin everything from roofs, whatever you need done, buildin houses, & dont ever forget, gettin big snakes for people. my folks own a plumbing & electrical supply store in douglas, ga, meaning they see LaRue probably every day. my mama said she was going to take a pic of LaRue just now, chillin on the counter without that big snake in his hands, but LaRue wasnt having it. when she sneaks one of LaRue for me, i'll post that one too. im off to get a pedicure. Laid on the beach much too long with Sara (Cheenie) yesterday, so i am not gonna be beach active today. cept when the sun is low, i'll jog. day two of beach jogging. that is, if it doesnt cloud up. seems to want to storm every afternoon here. nice after all that desert dry, the skin on my face likes it.